John Jacob Conroy, born Oct 24, 1917 to Wess and Frances (Spaulding) Conroy. John was born in Sleights Siding in Blair Township. The family farm was in the Boardman Valley on River Road. They lived there for several years working the family farm and his father working at the shingle mill. When John was about 7 or 8 years old the family moved to Freemont where they lived and farmed. There are many fond memories from living in Freemont. When John was 14 the family returned to the Traverse City area. Since he grew up during the depression he was responsible to do many things to help his family. 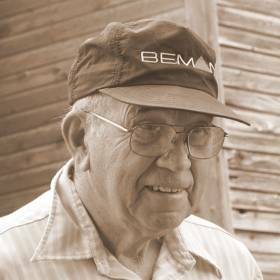 He did every aspect of work on the farm from feeding and taking care of the horses, to plowing and planting the fields. They did not own tractors, everything was done by horse or by hand. While working on the family farm he also worked on the Wilhelm Farm that was located where his Grandson, Daryl, now owns his own business. After Fort Knox he joined the 1st Armored Division (nicknamed “Old Ironsides”) the 13th armored Regiment and Combat Command B, one of 3 combat commands. His time in the United States Army would eventually take him aboard the Queen Mary to campaigns in North Africa and Italy and battles fought in Algeria, French Moroccan, Tunisian, Naples, Foggia, Rome, Arno, North Apennines and Po Valley. He served on a reconnaissance tank in North Africa, in the point tank, usually out in front of all of the other tanks. John said it was pretty dangerous, because you never knew what you were running into. Conroy and his combat command moved on to the Italian mainland and defended the front lines until the German forces surrendered in May 1945. The Italian campaign was the deadliest in western Europe with more than 600,000 troops killed. After being honorably discharged, he returned home on a fishing boat. He declined to fly on an airplane. He said to his grandchildren that he didn’t fly home on a plane and had never flown in his life. John met Helen Kolbasa at the Conroy homestead for a family get together. Helen thought that he looked like Gary Cooper and had to meet him. After a short courtship they eloped in Wayne County on December 7, 1946. After they were married they moved to Traverse City and lived on Cass Street. He opened the Conroy Brothers Service on the Corner of Front and Division with his brother, Sherman. He went to work at Sheffer Collet Machine shop in the heat treat department. They moved to the Conroy homestead; while moving into the farm house it burned to the ground. John and his brother Sherman built a home on the homestead for John, Helen and their four daughters. He continued to farm acquiring the property on the other side of River Road and across the Boardman River. As the girls grew up and began to get married and have children of their own, John found a farm in Kingsley. They moved to Kingsley around 1965. John farmed at both the Boardman Valley farm and the Kingsley Farm. He had dairy cows and sold the milk and cream to Kraft Foods. Helen and John also took in foster children. There was always room for more at the Conroy house. Helen passed away in September of 1972 after a short illness. John was reacquainted with a former classmate from Kingsley, Beulah Sedlacek. He invited her to ride with him to take care of the cows at the River Road farm. John and Beulah were married at the Kingsley Methodist Church, February 1973. 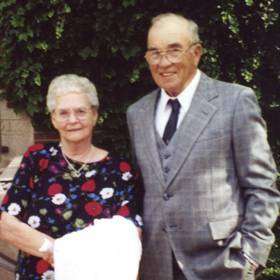 John and Beulah spent many years working together on the farm. Him doing the crops and the cattle. Beulah raising chickens for eggs and they both had a large garden. They had raspberries, strawberries and tomatoes that they sold both at the farm and took to farmers markets. John loved having the grand kids help with the farm. He had fond memories of Heather helping with the raspberries and tomatoes, picking them and taking them to market. He told the story of buying a new tractor and hiding it behind the shed. When Daryl came out, he told Daryl to go look behind the shed. He loved the look on his face when he saw the new tractor. Daryl purchased that tractor from his Grandfather and still has that tractor working on the farm. He loved seeing all of the grandchildren around the farm. John and Beulah would share the bounty from their large garden and fruit trees with the neighbors. He was especially proud of the peonies that he grew in the yard. He would take them to “his ladies at the bank”. John and Beulah loved to travel. They traveled extensively throughout the United States. He loved to take the back roads and not the main roads. You can’t see much of the country on a highway! John was an active member of the community. When his children were younger he was on the Sleights and Sabin School board. 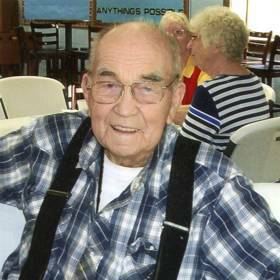 He was active in the Kingsley community on the Planning Board for Paradise Township. He was a member of the VFW and American Legion. John and Beulah were part of the Good Neighbors in Kingsley. It was a special part of their life with their many friends. John was a founding member of the Kingsmen. The Kingsmen had a food wagon that they took to the Bancroft Auctions. The proceeds would be used to help those in need in the community. They would help families in any way that they could. John could be found flipping burgers and hot dogs at every auction. John loved working in his work shop. He loved wood working. Later in life he began making picture frames. He was very proud and loved to give them to people as special gifts. He signed and dated every one of them. You knew you were special to John if you were a lucky recipient of one of those frames. John lost Beulah in November 2009. John’s grandson, Daryl had been working the family farm since he was a young boy, then John worked alongside Daryl even at the age of 98 he was still helping by driving tractors getting the fields ready for planting. He also raked hay and then picked up and stacked the bales with his tractor, they made a great team. He was born a farmer and continued to the end. He continued to work a large garden, raspberries, apples, peaches and grapes. He was the hardest working person, never letting grass grow under his feet. The Paul Harvey, Then God made the Farmer was a perfect description of John. John loved going to the Rock of Kingsley to play euchre with all of his friends. He rarely missed a Friday game. Wednesdays were reserved for lunch with the “Seniors” at the Rock. He is survived by his daughters, Janice (Victor) Rioux, Eileen (Terry) Bigelow, Maureen (Bob) Nelson, Irene (Leon) Hulett; stepdaughter, Nancy (John) Kenyon; stepson, John (Melinda) Sedlacek; special friend, Flossie Loutonin ; grandchildren, Victor (Monique) Rioux, Rickie (Chris) Steinmiller, Mike (Ann) Rioux, Joe ( Brenda) Rioux, Christine (Tracy) Orr, Tom Rioux, John (Dottie) Lehn, Daryl (Tina) Lehn, Joyce (Scott) Harington , Danielle Nelson, Heather (Steve) Craker, Heidi Nelson, Nicole Ruiz, Scott (Rigel) Hulett, Ross Hulett. Kristen (Jeff ) McDonald, John (Jessica) Kenyon, Sara (Roland) St Armand, William (Cyndi) Sedlacek, Melissa Sedlacek,; 27 great-grandchildren and 22 great-great-grandchildren. "Today I lost my great grandfather. 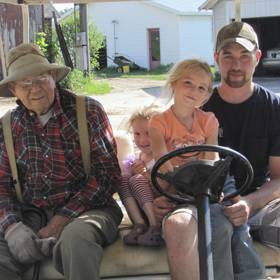 I will forever hold strong to the memories made and hours spent talking with him about farming and maple syrup. Talking about the good ole days and hard times talking about WW2 and the men that he saved along with how proud he was to serve our great country. He was born a small town man with a big heart for his land born and raised on River Road in his family's farm house he grew up to work the land and loved every minute of it. I'll miss seeing him out in his garden that he so loved and looked forward to doing every year. I'm proud of the life that he lived and most of all I'm proud that he grew up and passed on doing what he loved the most. God gained his farmer back just in time to start working the fields on the other side. I'll see you again one day grandpa Conroy until then rest in peace and tell everyone I said hello. 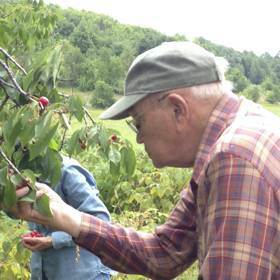 "Grandpa Conroy’s passion and pride were his raspberry patch, his tomatoes and his flowers. He loved to share his passion with everyone. Before his hands began to tremble more, he made a special piece for each of his daughters in his wood shop. He got around the yard on his golf cart and also used his golf cart to put his garden tools in and drive up and down the rows to hoe. Even last summer when his knees began to fail him. He would get the cart out of the garage and head out with his garden tools. He would park the cart and use his cane and the hoe to stand up and hoe just as much as he could and then get on the cart and move it down to the next part. He also used his antique tractor to cultivate the corn every year. He would use a 5 gallon bucket to haul himself up into the seat. He always had on his “garden” hat with the big wide brim and a handkerchief in his pocket. Everyone watched for him in the garden and honked and waved as they went past the farm. He also helped Daryl work on the tractors and machines or at least came out to give his support by getting the tools out that were needed for the job. When the corn started coming up in the fields, he would take his golf cart out to check out the fields and give the growth report to Daryl at dinner time." Services will be held 11am, Thursday, April 13, 2017 at The Rock of Kingsley. The family will greet friends starting at 10am. Burial will be in the Evergreen Cemetery, Kingsley. 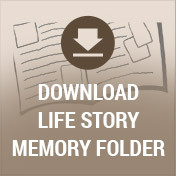 Please visit www.lifestorytc.com to sign the guest book, view photos and share your thoughts and memories with the family and more. The family chose Life Story Funeral Home, Traverse City.